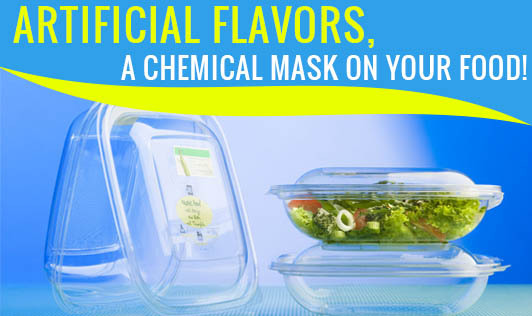 Artificial Flavors, A Chemical Mask On Your Food! Many of the processed foods or ready to eat foods that we buy come with an ingredient called "artificial flavoring". Now what is this artificial flavoring? And what are the actual ingredients used to make an artificial flavor? Artificial flavors are mixtures of various chemicals made in a laboratory that mimic the natural flavors. As food product loses its natural flavor during processing, these chemical mixtures are added to enhance the taste, flavor and aroma of the food. Different chemical combinations besprinkle flavors back into the processed food. For example, the strawberry flavor in your food contains forty nine chemical ingredients! And the most commonly used vanilla flavoring is either derived from petrochemicals or from the byproduct of paper industry! These are just a few examples. The list of all artificial flavors is endless! There is yet another misleading ingredient in your food that is still more mysterious.' Natural flavors', these are created from natural products and transformed into chemical additives. The word ‘natural' is misused to create impression that is does not involve any chemicals. ‘Center of Science in Public Interest ‘has a list of index and food additives. Robyn O' Brien, author of ‘The Unhealthy Truth- How our food is making us sick and what we can do about it', points out that one reason of disproportionate sickness is because, our food system is broken. Studies also suggest that there is a link between use of artificial flavors, colors, preservatives, and sweeteners that can lead to behavioral problems in children, ADHD, epidemic of obesity, allergies, asthma and cancer. • Cut down on the use of all kinds of artificial colors or such similar products. • Read labels. Any ingredient table that says ‘artificial', dump that product. • Cook at home more often. The more raw ingredients you use, more artificial ingredients are avoided. • Eat simple and natural, the way our grandparents ate. Always remember, don't eat anything with ingredients you can't pronounce or you are unfamiliar with!